Denver’s public database of traffic deaths substantially undercounts the number of people killed on city streets. The Vision Zero dashboard, a data tool launched when Mayor Michael Hancock committed to ending traffic deaths and serious injuries more than a year ago, aims to “help the city and partners focus on eliminating traffic-related deaths,” according to the mayor’s office. But the dashboard does not accurately reflect the death toll on city streets. 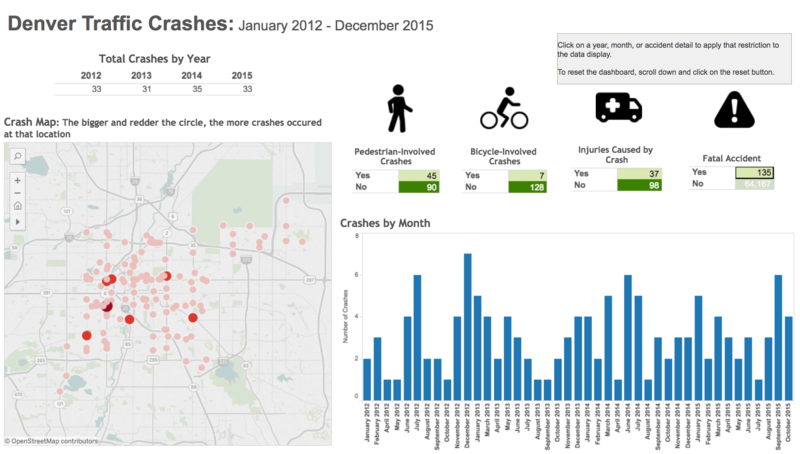 The dashboard, maintained by Denver Public Works, puts the total number of people killed in traffic between 2012 and 2015 at 135, including 51 people killed while walking or biking. Documents from the Denver Police Department tell a different story, however, putting the totals at 195 total traffic deaths (more than 40 percent higher than the dashboard) and 78 pedestrians and cyclists, (more than 50 percent higher) [PDF]. DPW knows there is some discrepancy. “This Public Works data may differ slightly from the crash reports owned/maintained by the Denver Police Department,” says the disclaimer on the dashboard’s website. If a case is not closed, like an unsolved hit-and-run, it may not show up in the data, a DPW spokesperson told Streetsblog. But there are also closed cases in Denver PD’s records that do not show up on the dashboard map. John Aguila was killed on the 2800 block of California Street in 2013, for example, and police named Candice Porch as the driver. Also unaccounted for in the dashboard are: Valentino Abeyta, killed by a hit-and-run driver on Federal Boulevard and Harvard Avenue in 2015, and Za May and Ah Zet Khan, children killed by a hit-and-run driver while walking near 13th and Yosemite in 2013. The problem is not simply a matter of statistics — each of these victims had their lives cut short, causing enormous pain to their family and friends. The point of Vision Zero is to recognize that these tragedies are preventable, and to take steps so other people don’t suffer. Data plays a huge role in that effort. Keeping an accurate public measurement of people killed and seriously injured while walking, biking, and driving enables the public to track progress and hold officials accountable for the success or failure of their street safety policies. If the Hancock administration is serious about preventing loss of life on Denver streets, giving the public accurate information is essential. why aren’t they just using the police department numbers? Why is there two agencies tracking deaths on city streets? Yet, still I comment. I wonder what Descartes would think of this. Speed and running red lights along with right turns with a pedestrian crossing light add to the problem. When was the last time you saw a squad car in Denver checking speed and the other issues. We also need signs that say no right turn when the pedestrian light is activated.